Arm elevated to 90 and 135 degree, forearm in right-angel position to the humerus. Inside-rotated in figures 1 and 4, in mid-position in figures 2 and 5 and outside-rotated in figures 3 and 6. 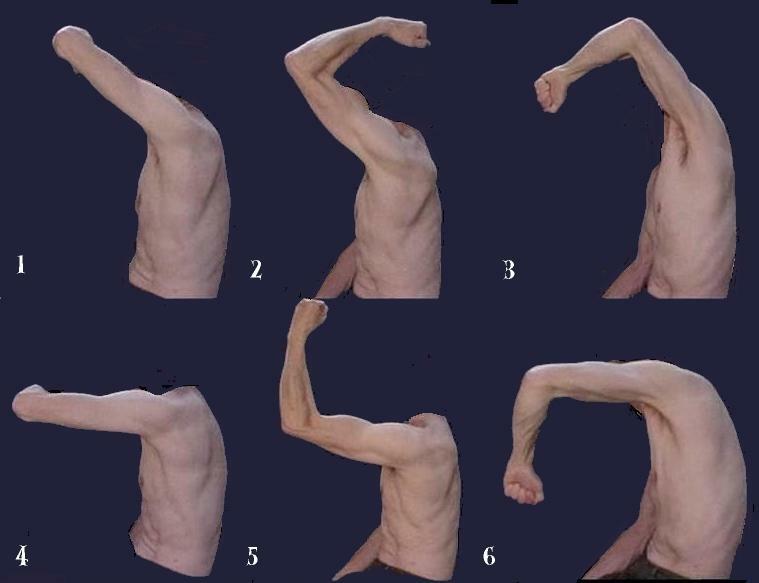 Lifting of the arm involves a clockwise rotation of the scapula, and a lateral and forward movement of the lower angel of the scapula, the left border of the scapula and the teres mayor becoming part of the lateral upper thoracic border (figures 1,2,3 versus 4,5,6). !!! In fig. 2 the brachialis appears to over-pass the brachioradialis. This effect does not reflect true underlying anatomy. It is not observed in fig. 5.